Here’s a Catholic trivia question: What’s the Pope’s church? If you answered, like most people, “St. Peter’s at the Vatican” – you’re incorrect. The Pope’s church – the cathedral for the Diocese of Rome, Italy – is St. John Lateran. But because it is the Pope’s church, St. John Lateran is officially the “mother church”. It is known as the mother and head of all churches of Rome and the world! 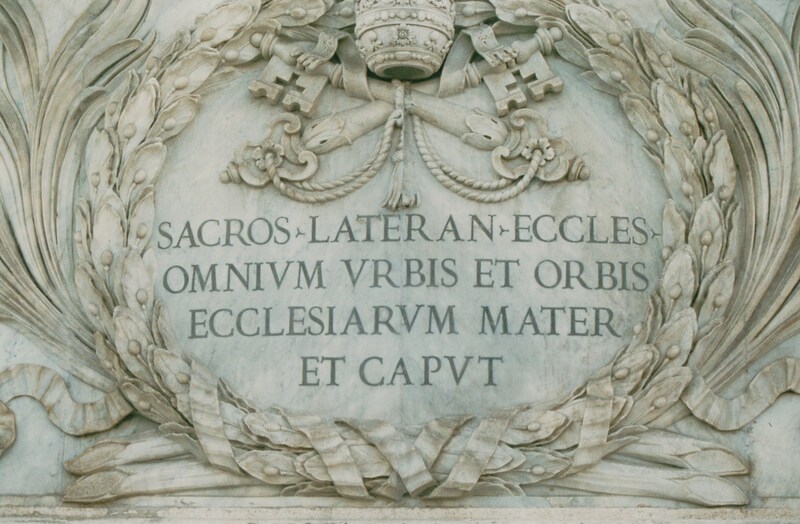 In Latin: "The sacred Lateran, mother and the head of all churches of the city and the world" SOURCE: St. John Lateran (Rome, Italy), photographed by the author on March 5, 2000. A basilica has stood on this site since the 4th century. The current façade dates from the 18th century, but much of the interior is from 1646. Beneath the high altar is a small table which tradition holds was used by St. Peter to celebrate Mass. The basilica has withstood fire, earthquakes, and wars – and even two attacks by the Vandals. Canopy over the papal altar. SOURCE: St. John Lateran (Rome, Italy) photographed by the author on March 5, 2000. Today, November 9th, the Roman Catholic Church everywhere celebrates the Feast of the Dedication of St. John Lateran. Normally a dedication of a church is celebrated and remembered by its parishoners. In the case of St. John Lateran, we as Catholics are all parishoners whether we’ve been to visit or not. Today’s feast is our universal celebration of our mother church! The author and friends outside of St. John Lateran. 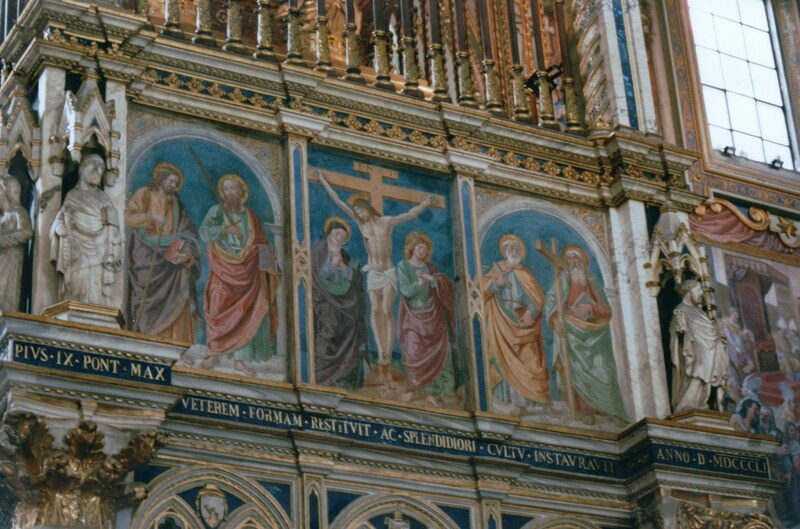 SOURCE: St. John Lateran (Rome, Italy) photographed by the author's friend on March 5, 2000. I've been researching my Bavarian and Polish ancestors since 1989. 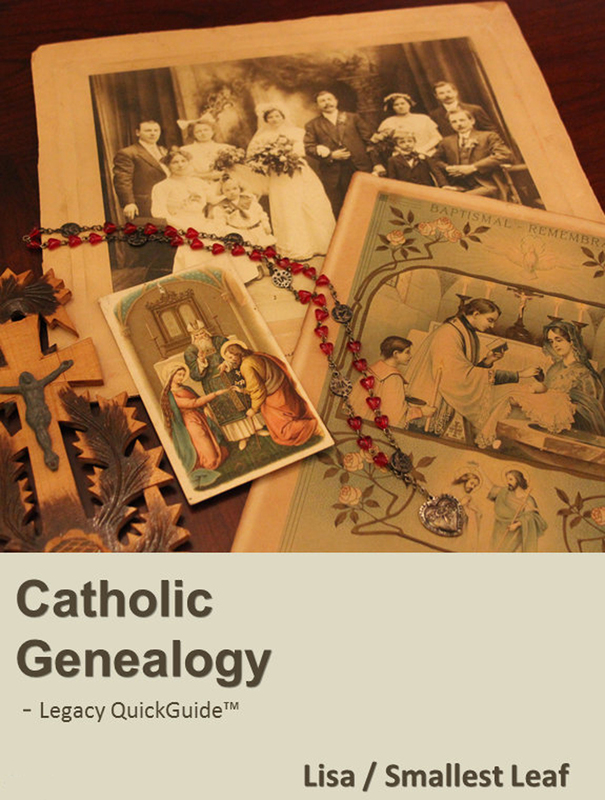 Read all about my adventures in genealogy at What's Past is Prologue (http://pastprologue.wordpress.com). Besides genealogy, I love travel, books, music, and Shakespeare! 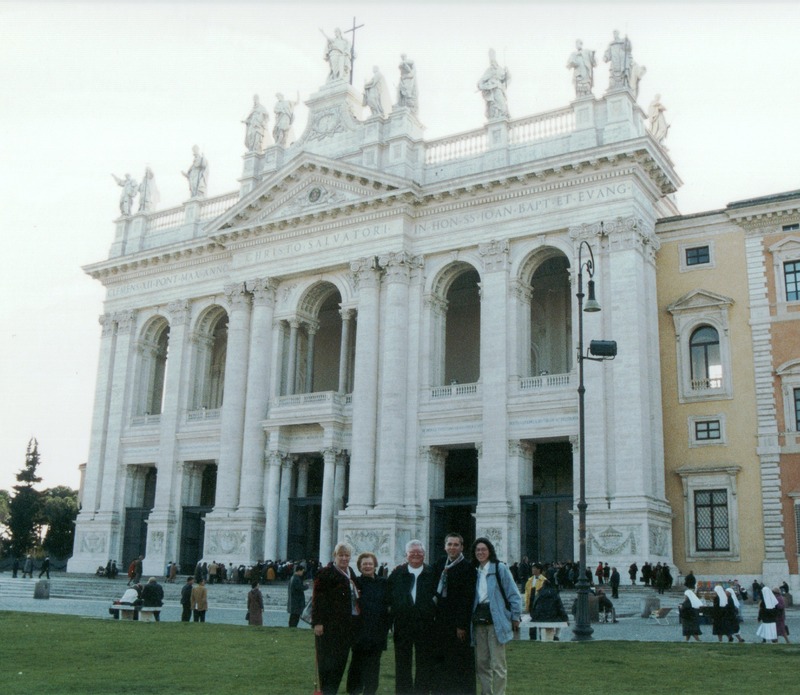 I was in Rome in 2005, and remember St. John Lateran as having the heroic-sized statutes inside. Also the Sancta Scala nearby. Donna, I never knew that! I had always thought that St. Peter’s was the Pope’s church! Thanks for the info about St. John Lateran.. Thanks for introducing us all to our “mother church” through your article and photos, Donna. It’s a pretty special place that can merit it’s own feast day on the Catholic liturgical calendar!